Check Out the Next Season! 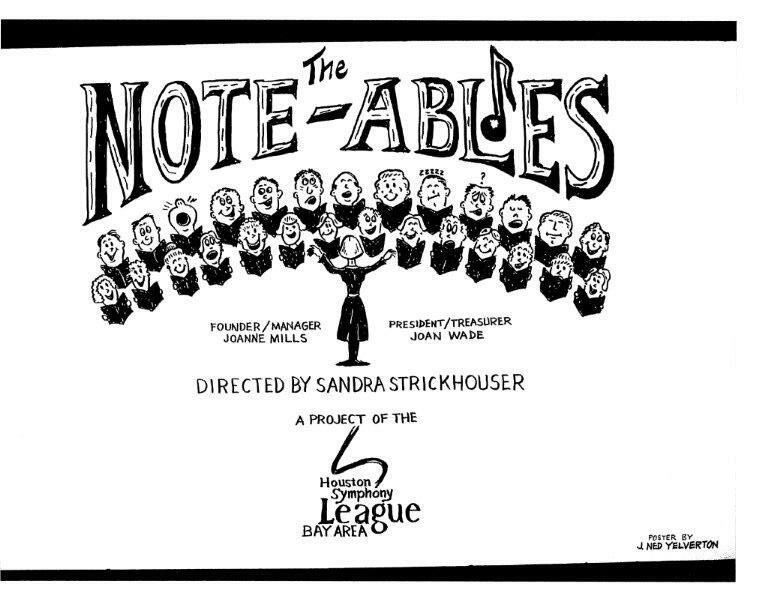 Our May 8 meeting will take place at Bay Oaks Country Club, 14545 Bay Oaks Blvd., Houston, TX 77059 beginning at 10:30 a.m. Our program will be HSLBA's own Note-Ables, a chorus specializing in "The American Song Bag" that spreads joy to community groups and senior centers in the name of HSLBA all over Houston. Following the program, there will be a luncheon. Tickets are $30 each and you must pre-pay to reserve a spot at the luncheon. You can pay for tickets by mailing to Martha McWilliams/15719 Pinewood Cove Drive/Houston, TX 77062. Be sure to indicate "May Luncheon" in the memo line of your check and make the check out to HSLBA. We will also be installing our new officers at the program. Please note - you cannot buy tickets at the door. They must be purchased in advance. For any questions, please call Martha McWilliams at 832-498-1658. The Houston Symphony League Bay Area (HSLBA) is a dream realized by Fran Strong and Selma Neumann, the first presidents. Chartered in 1976 under the auspices of the Houston Symphony, its mission is to promote music appreciation and enrichment. HSLBA presents music programs for all students in CCISD elementary schools. Membership is open to anyone who wants to enjoy, support or promote the music of the Houston Symphony. Guests are always welcome. For further information about monthly meetings contact us at 281-488-7614.